Summary: In medieval Paris, Marguerite helps her nearly blind father finish painting an illuminated manuscript for his patron, Lady Isabella. NOTE: Gabriel and the Hour Book by Evaleen Stein would make an excellent family read aloud for the time you're doing this unit. Or perhaps an older student could read it on his own to go along with this unit. A delightful almost 100 year old book! Get it from your library, or you can read it on-line at the Baldwin Project. **There are links to diagrams (the eye, the nose, etc.) in this unit. If you decide to use these in your lapbook, you can use the titles found in these files to paste on the covers. You will also find a title for "My Calligraphy Sample"; your student can paste this on the front of his calligraphy if you choose to do that activity. The other title is for the Character Chart. The setting of our story is Paris, France during the Middle Ages. The Middle Ages are also known as the Medieval Ages. The Middle Ages came between (in the middle of) the Ancient World (before the 400s AD) and the Modern World (after the 1400s AD). The time period of the Middle Ages could also be defined as the time between the fall of the Western Roman Empire (476 AD) and the fall of the Eastern Roman Empire (1453). It is somewhat of a myth that the Middle Ages were a time where education was put on a back burner and that no advances in science and technology were made. The Middle Ages occurred in all cultures, but for this lesson we will focus on the European Middle Ages. The Early Middle Ages occurred from ~500 AD to ~1000 AD. During this time, many people invaded Europe now that the western half of the Roman Empire had fallen. This portion of the Middle Ages has also been called the Dark Ages, a reflection of the many invasions. Trade declined because of the invasions. The lack of a central government created chaos. With no government, the people looked to the strongest local leader for protection. Contact with other parts of Europe and the Middle East was all but lost completely. Eventually the Catholic church would rise as a central organizer. The High Middle Ages occurred from ~1000 AD to ~1300 AD. Finally, peace and order! The instability and the invasions of the Early Middle Ages finally came to an end. As such, peasants expanded their farms and villages, merchants traded more and long distance trade was revived, town governments began, and universities were built. During the High Middle Ages, Europe's population doubled. The Late Middle Ages occurred from ~1300 AD to ~1500 AD. This portion of the Medieval Ages was once again marked by war and governmental upheavals--and on top of that, there were also natural disasters! England and France fought over who should rule France. This began a war that started in 1337 and ended in 1453 and was known as the Hundred Years War. (Have your student do the math--what a silly name!). As if it weren't enough for the countries to be fighting, the Catholic church leaders (popes) also fought about which one should be leader! During the early 1300s, a mini ice age began (and lasted until the 1700s!) and Europe was much colder and rainier. Under these weather conditions, crops failed and food prices soared. Then from 1348 to 1351, the Bubonic Plague (also referred to as "The Black Death") ravaged Europe. Whole villages disappeared in a matter of hours. Before it's end, as much as half of the population of Europe died from the plague. Not all of the Late Middle Ages were bad though. A revitalization in learning and the arts began. Brave men began to set sail for new worlds, beginning at age of exploration. Also the Late Middle Ages saw the creation of an invention that would change the world: Johann Gutenberg's printing press. His invention in 1440 allowed the copying of a single page of text onto many sheets of paper. The papers were then collated together and bound, and thus several copies of the same book were created. Prior to this, books were copied by hand, one at a time, as in our story. * Our story depicts city life in the Medieval Ages. Have your student research and compare/contrast medieval country life with medieval city life. the castles, the social system, the church, etc. If your student shows an interest in a topic that is touched upon this week, let him explore it deeper. Our story is set in Paris, France, nearly 600 years ago. Have your student locate France on a globe or map. Paris, located on the River Seine, is the capitol of France. During the Middle Ages, Paris was an important city. If you look at the two page spread as soon as you open the book, you have an idea of what Paris looked like 600 years ago. Notice the wall that surrounded the city. That wall was built between 1190 and 1220 and is called Philippe-Auguste's Wall. During the time it was built, King Philip August reigned. It was built to provide protection from warring armies. It was complete with battlements, fortified gates, and round towers. Sections of the wall are still visible today. During the Middle Ages, men created beautiful books. Back then, books were not printed by the thousands as they are now. Each book was painstakingly copied and bound--all by hand. Books of Hours contained prayers, hymns, psalms, and sometimes lessons learned from other people--very similar to our books of devotions today. The pages within were highly decorated, which gave the book (and its illuminator) prestige. Often a book of hours would also contain a calendar to remind the owner of important holidays. These pages were often decorated with scenes associated with that time of year (spring, harvest, etc.). Often, too, a Book of Hours would include a picture of the owner. Only the wealthy could afford to commission someone to make a Book of Hours for them and to pay them for the expensive materials required to make it. Making a book during the Middle Ages was a very long and often tedious process. First, parchment (also called vellum), made from animal skin, had to be prepared specifically to receive ink and paint. Then its surface was ruled by an assistant to allow for straight lines. A scribe carefully copied the text, leaving spaces for the illuminator to decorate. Then an illuminator added the decorated uppercase letters and created beautiful scenes and borders for the pages, using goldleaf and bright colors. Then pages were placed in order, and the book was bound. The most famous Book of Hours is Les Tr�s Riches Heures du Duc de Berry. It was commissioned by Jean, Duc de Berry, in 1413. He loved books and owned 14 Bibles and 15 Books of Hours. The book had actually been started in 1384, but left unfinished (perhaps the artist died?). Jean died in 1416 and the book was once again left unfinished. It was finally finished during the years of 1484 to 1489...over 100 years after it was originally started. The Book of Kells, while not a Book of Hours, is another beautiful example of an illuminated work from the Middle Ages. It contains the four gospels, written in Latin. It is one of the most famous manuscripts to have survived the Middle Ages. It contains 680 pages--of which, only two are undecorated. Here are some of the pages from the Book of Kells, each highly decorated. Visit this excellent interactive demo of how a Medieval manuscript is made. 1. Where does our story take place? 2. What is a manuscript? 3. What is a "book of hours"? 4. What were some of Marguerite's chores at the workshop? 5. Why were his glasses Papa's most precious possession? 7. Why did Papa not want Marguerite to help finish the book? 8. Name something that Papa and Marguerite got from Master Raymond. 9. Why did Papa ask Master Raymond to load him a few francs? 10. What happened to Papa's glasses? Notice the two page spread as soon as you open the book. This is aerial view of the city of France and the land around it, as it looked almost 600 years ago. Review or explain that an aerial view of something looks as though the person viewing it is looking from way up high in the sky (air). Point out the River Seine that runs through Paris. Notice the Cathedral sits on an island and that Paris lies on both sides of the river. Point the two roads going into and out of Paris...how they connect the island to both parts of Paris. Point out the wall that surrounded Paris. (Has your child rowed HSS's Fritz and the Beautiful Horses?...you might remind him of that walled city.) Have him notice that only large buildings in Paris are shown on the map....ask your child if, in looking at this picture, he thinks there are a bunch of people who live in Paris. It would be logical for him to conclude that there are not because this picture does not show many houses within the wall. Now turn the page. See if your student makes the connection that this the same picture of Paris, only closer up. It's still an aerial view, but now much closer. Now you can see all the little brown roofs of houses. Now ask him if a bunch of people live there. "[Marguerite] set out clean brushes and oyster shells to hold the paints..." Discuss the importance of preparing for a project before starting it. You may also want to discuss the importance of cleaning up after you finish. A good exercise in the importance of preparation would be cooking a recipe. Emphasize to your student the importance of making sure you have all the ingredients you need before you start mixing and stirring. If you start throwing ingredients in a bowl before you prepare, you may end up not being able to complete what you've started. It's also a good idea to make sure all your bowls, measuring cups, and utensils are washed and ready to go before you start. Let your student choose a recipe to make this week. Let him prepare by setting out everything he will need before he starts. If he needs an ingredient that you don't have on hand, he should make a shopping list. Papa Jacques eyeglasses were very important to him. Why did he need them? Sometimes the parts of an eye don't work together like they should causing people to have a hard time seeing things. Glasses can fix this problem. Your eyes bend light rays so that the image can be focused sharply on your retina (and interpreted by your brain). Most people have vision problems because their eyes aren't refracting (bending the light rays) in the right way. Glasses (and contacts) can fix refraction problems by bending the light in the right way -- in a way that lets a person see more clearly. You may also want to discuss common refractive problems with your student-- nearsightedness and farsightedness. In both cases, the image the person is trying to view is not properly focused on the retina. With nearsightedness, the image becomes focused in front of the retina. With farsightedness, the image is focused behind the retina. Another refractive problem is called astigmatism (uh-stig-muh-tih-zum). This means that the cornea is an uneven shape causing it to bend the light in different directions; this distorts what the person is looking at making things fuzzy or blurry. Try using this eye chart to see what shape your vision is in. Nice diagram of a cow's eye, which is very similar to a human eye except we do not have a tapetum. just about anything you can imagine-- ropemaker, jewlerymaker, glover, locksmith, butcher, hatmaker, weaver, carpenter, jeweler, tailor, shoemaker, etc. Good writing usually includes some sensory details allowing the reader to transport himself or herself into the story. In this section ("In Which Marguerite Meets Many People..."), Robertson has included words and phrases that give the reader a chance to smell what Marguerite smells. When Marguerite goes to the farmhouse, it smells foul. "She fished in her pocket for a handkerchief scented with lavender. She held it up to her and tried not to breathe." Another example of sensory smell details is found when Marguerite visits the apothecary. "There was a peculiar musty smell, like damp spices and moldy straw." Encourage your student to use sensory details (for all five senses) when he writes. 1. Why did Marguerite have to complete Papa's errands without him? 2. Recall the places Marguerite went and what she got from each place. 3. Responsibility is able to choose for oneself between right and wrong and taking charge of or being trusted with important matters. Did Marguerite demonstrate this character quality? How? In 1160, it was announced that plans were being made to build a grand cathedral on the Cite (Ami the e has an accent over it.) Island in the Seine River in Paris, France. The Cite Island was a natural choice, as it had been considered sacred ground for over a thousand years. First with the Celts, later with the Romans, continuing to the time they decided to build Notre Dame. An existing church was razed to make way for the new cathedral. Gothic architecture started in France about 1150 and was popular throughout Europe until about 1400. Gothic architecture used new techniques of construction that allowed taller buildings to be created. Gothic builders learned that pointed arches were strong and stable and helped support the weight of the roof. The Cathedral of Notre Dame was the among the very first to employ the use of flying buttresses to prevent the arches and roof from collapsing. The Gothic builders also came up with ribbed vaulting to support the weight on columns. For pictures of pointed arches, flying buttresses, and ribbed vaulting. These new methods of building led to buildings of amazing heights. The west facade towers of the Cathedral of Notre Dame in Paris are 226 feet tall. The original plan called for steeples on top of the towers, to make it even higher; however, they were never added. (It would have looked like this if they had been added.) The main vault (ceiling) inside the cathedral is 112 feet high. Another characteristic of Gothic architecture is the rose window, a beautiful, gigantic, full circle stained glass window. Two of Notre Dame's rose windows are among the only medieval rose windows in all of Europe that have survived through the years. A gargoyle is a technical term that architects use to mean a waterspout. Artists of the Middle Ages created fantastical gargoyles, often quite ugly and scary. No one is sure just why these kinds of figurines were added to the buildings. Here a few reasons that historians have thought about. Most people during the Middle Ages were unable to read. When buildings were built, the carvers may have used their creativity to tell some of the well-known stories of the timeperiod or lessons from scripture. Or perhaps the carvers were inspired by the costumes worn during plays or during the Feast of Fools celebration. The gargoyles may have been inspired by some of the skeletal remains of dinosaurs; an interpretation of what the artist believe the animal would have looked like. Some believe the gargoyles were meant to be guardians, that scary looking figurines would keep away evil. There is also a legend about a fierce dragon named La Gargouille that lived in a cave near the River Seine near Paris. A man named Romanus saved Paris by capturing the dragon and burning it. 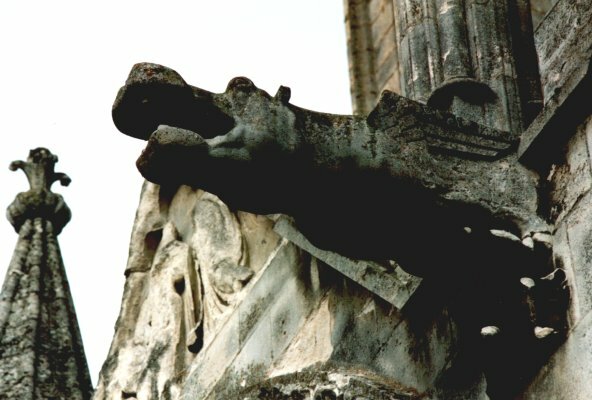 This dragon may have served as the model for some of the gargoyles on buildings. Whatever the reason, there were many gargoyles created during the Middle Ages. Even some modern architects continue the practice of adding these decorated waterspouts to their buildings. What farm animal products is your student familiar with? (eggs for eating, milk for drinking, feathers for pillows, etc.) Discuss the ways that animal products were used in this story. Before the invention of plastics and other things, we had to use animal products to make many different things! Human Anatomy -- The Sense of Smell: "Marguerite entered a dingy shed behind a farmhouse. Inside, it smelled very foul. She quickly fished in her pocket for a handkerchief scented with lavender. She held it up to her nose and tried not to breathe." Our sense of smell is called olfaction. It helps us understand the world around us, just as our eyes and ears do. How does our sense of smell work? It starts with the molecules (teeny-tiny, too-small-to-see bits) of the scent float through the air and are inhaled. These molecules go into our nasal cavity (the space behind your nose) and hit the olfactory epithelium (eh-puh-thee-lee-uhm). The epithelium contains milLions of special olfactory receptor cells. Different cells respond to different smells and those affected cells send a signal the olfactory bulbs (located just above the epithelium and just under the front of the brain), where it is processed by the brain. The brain can interpret about 10,000 different variations of the reception cells, translating them into a specific odor (in other words, the brain can identify about 10,000 different smells). Because our nasal passages are connected to our mouth, some odor molecules reach the olfactory epithelium by inhaling them through the mouth. That is why our sense of taste is affected when when have a cold. Our sense of smell is just one more way God proves his creativity--just like no two people have the same fingerprints, no two people have the same odor-identifying abilities. Print this graphic and have your student label the nasal cavity, the olfactory epithelium, and the olfactory bulbs. Water; alcohol; camphor; lemon juice; orange juice; soda pop; coffee; different perfumes; vanilla; vinegar; juice from crushed garlic, onion, or green pepper, etc. Flavorings or extracts like anise, almond, etc. would work. You could rub the cotton ball on to a leaf or petal of an aromatic plants and flowers such has lavender, roses, honeysuckle, mint, oregano, basil, etc. You could also sprinkle on a bit of cinnamon, ginger, pepper, baby powder, etc. Have your student try to identify each scent. You could have him write the baggie's number on a sheet of paper and then write his guess beside each number. Have your student hold his nose (or place a nose plug for swimming over his nose) and then try to guess each scent. Is he able to smell as well? Why or why not? Have your student classify the various odors, by making a list of the good smells, bad smells, no smells, etc. Have him put a star beside his favorites. Have your student classify the various odors according to the seven primary odors. You and your student could also go for a walk. Have him make a list of all the smells he encounters. Lapis Lazuli is a semi-precious gemstone, usually a beautiful blue color, but it can sometimes (rarely) be purplish-blue or greenish-blue. It contains a mixture of minerals: mostly lazurite (which gives it the blue color) with bits of gold pyrite or white calcite mixed in with the blue. Pictures and More Pictures. During the Middle Ages and up until the 1800s, lapis lazuli was ground and mixed with oil to make blue pigments for paints. During this time, lapis lazuli cost even more than gold. If your student has already study geology, let him know that lapis lazuli is formed through contact metamorphism. Marguerite is a French name that means daisy (literally, it is the French word for daisy). It is derived from a Greek word meaning "pearl". Take some time to share with your student why you chose the name you chose for her. Look up the meaning of the name. If your student is interested, look up other family members' names. Look at the second picture of this chapter. You can see a close up picture of the unpainted manuscript that Marguerite is about to "illuminate." The writing style is an old style of writing that many people like to do today as a hobby. It is called calligraphy. If possible, show your child a calligraphy set. Show him the different colors of ink and the different nibs. Show him how they work. Let him try! Read through Math lesson first. Break up the egg yolk in a bowl, measure 2 teaspoons, and put in the jar. Add 1 teaspoon of water and 1 teaspoon of powdered tempera. Stir till smooth. Whip one egg white till frothy, just before it begins to turn into meringue; add 1 tsp of the egg white to the parsley juice (the color lightens slightly). Your student will need to let the paint dry and add layers to get it darker. Marguerite was an excellent painter. Was this her first time painting? (No, refer to section II where the reader can infer that she had painted before). Ask your student-- "how do we know this wasn't Marguerite's first time? (Marguerite had used the scrap edges of the parchment skin to use for drawings.) Do things usually come easy the first time? No, we have to practice, practice, practice! Encourage your student to keep on practicing in order to develop his talents and gifts. Gold leaf is gold that is beaten into extremely thin sheets that are used for gilding (applying metal leaf to a surface). Gold leaf is available in a wide variety of karats and shades, the most common being 22-karat yellow gold is the most commonly used. You may want to find and purchase (at an art supply store) gold leaf and the supplies to use it. Let your student try it for himself. A ratio is the relationship in quantity, amount, or size between two or more things. The egg tempera calls for 2 teaspoons of egg yolk to every 1 teaspoon of powdered tempera. This can be written two different ways-- 2:1 or 2/1. Find ratios around your house. How many boxes of cereal do you have? How many gallons of milk? Write it as a ratio. How many vacuum sweepers do you have? How many floors need swept? How many folders does your student have? How many different subjects? If you wanted to double the paint recipe, how much would you need? What if you wanted to triple it? What would the ratio be now? (If your student has learned how to reduce fractions, let him reduce the ratios to see that it's the same ratio even when doubled or tripled. i.e. doubled -- 4:2 or 4/2 = 1/2. tripled-- 6:3 or 6/3 = 1/2. The ratio always stays the same. What would happen if you didn't follow instructions on the paint recipe and you changed the ratio? What if you added 1/2 teaspoon powdered tempera to every 2 teaspoons of egg yolk? Would the paint turn out right? You may want to hypothesize an answer and test it. Try as many different ratios as you can. Which ratio do you think works the best for the paint? Who doesn't love daisies!? They add sunshine wherever they bloom. They are easy to grow (great for a beginning gardener) and perfect to cut for indoor flower arrangements and vases. Daisies are a perennial ( living for several years usually with new leafy growth produced from the base each year). You can start some from seed and expect them to bloom the second year and every year after. Daisies prefer rich, well drained soiled in a sunny location, but they can grow in lesser conditions, too. They will get thicker each year, so you need to divide them every three or four years if you'd like to yield bigger, more beautiful blooms. Lots of different varieties of daisies exit. One of the most popular is the Shasta Daisy. Take some time to research the different varieties of daisies. You may want to add a small daisy patch to your flower garden; if you want blooms the first year, be sure to buy a plant at a greenhouse, garden center, or nursery. Read Exodus 20:12 with your student (the fifth commandment). It admonishes us to honor our parents. How did Marguerite do this? The text says the paint was "the color of heaven"
What does the Bible tell us about heaven? Read through Revelation 21 and discuss the different ways heaven is described. During the Middle Ages, trading in towns was controlled by guilds. There were two different kinds of guilds: Merchant Guilds and Craft Guilds. The merchant guilds were powerful traders. They worked with the town governments to control the trade in the towns. They would set the prices that members could charge for an item and also tell them where they were allowed and not allowed to sell. They tried to assure that their members did not cheat. The craft guilds were skilled workers/craftsmen. They tried to ensure their members' work was well done. They tried to improve working conditions and set wages for their members. Members of the craft guild were divided into Master, Journeyman, and Apprentice. A master was a very accomplished craftsman. An apprentice was someone who was trained by a master of a particular occupation. In the Middle Ages, training started at about 12 years of age. The parents would pay someone to teach their child anywhere from two to nine years, though five to seven were average. The apprentice then went to live with his employer, where in addition to skills, he also received food, clothes, and lodging. An apprentice received no or very little pay during this time. Some of the occupations that apprentices of the Middle Ages learned included: apothecary, carpenter, weaver, stonemason (stone cutter), baker, butcher, cordwainer (cobbler/shoemaker), tanner, embroiderer, and tailor. In our story, Marguerite was a limner apprentice. Refer to occupations lesson in section II for more information about occupations. Why do you think this section was entitled "A Surprise"? Who was surprised? Were you surprised as to what happened? Was Lady Isabelle? Papa Jacques? Andre'? The author introduces us to many different characters in this story. After you've read the story multiple times, help your student fill out this prepared character study chart. Help him think of two words that sum up or describe each character. Make sure that no two characters are given the same descriptive word. Read the Note to the Reader at the end of the book. How did Bruce Robertson get the idea for this story? Recall some of the stories your student has written. Discuss the inspiration for those stories. Were any based on real life events? Were any of the stories rooted in fact but took off in a fiction format like Robertson? Point out to your student that almost every page begins with a decorated letter, a large extra fancy letter that usually begins a paragraph or a new page. The book cover, title page, author's note, and even the info about the author and illustration on the dust jacket also have decorated letters. Let your child sketch out a fancy letter (perhaps his initial?) and let him decorate it!! You may wish to get Illuminated Alphabets by Patricia Carter from the library. It has step-by-step instruction and then lots of examples. Or visit this site for instructions for using your computer's Old English Font to create a letter for your student to decorate. The Old English Font can be downloaded here. Near the end of the story, on the page where we can see Marguerite coloring in Lady Isabelle's robe, we also see what looks to be a historiated letter. To the right of Marguerite's hand is a decorated capital letter "D." Inside the letter, looks to be a miniature picture of Lady Isabelle. In a Medieval manuscript, whenever a decorated capital letter contains a painting that pertains to the the text, it is considered a historiated letter (vs. a decorated letter). Beautifully decorated books from the Medieval Ages were true works of art. Unlike mass produced books of today, each book is unique. Sadly, most artists of those manuscripts are barely known except in specific art circles. Take a virtual tour of an illuminated manuscripts exhibit. Click on a thumbnail one of the various of manuscript pages shown to make the image larger. Then zoom in and move around the image. As always, preview the content of images to determine appropriateness. Select a few to discuss with your student. (To view images of a different theme, click one of the themes listed at the left.) Show your student the images you have chosen to discuss. Discuss the time it must have taken an artist (depending on the type of manuscript, often years were spent on the book). Talk about the colors. Did the artist use flowers or animals or both to decorate the margin. Who is/might be pictured? What might be happening in the scene? Are there any decorated letters? Historiated letters? An interesting side note: there is a project currently underway to complete a hand-written, illuminated Bible. It is called the St. John's Bible. It will use the same techniques and materials that were used in the Middle Ages. If it is completed, it will be the first hand-written, illuminated Bible since the invention of the printing press. If your book has its dust jacket, show your student the flap that gives more info about the author and illustrator. What does he notice about them? The pictures are drawn so that they look as like they live in the Middle Ages! A Medieval Alphabet to Illuminate, Bellerophon Books, Santa Barbara, CA. Papa Jacques was concerned about his reputation. What is a reputation? In Proverbs 22:1, the Bible says, "A good name is rather to be chosen than great riches, and loving favour rather than silver and gold." What is a good name? Why is it important? Let your student make a Prayer Book! Make a booklet, choose prayers or uplifting Bible verses for your student to copy, and then let him decorate his letters, write in calligraphy, and illuminate the pages within. The LeavesOfGold.org website has instructions and templates you might want to use. Master and Lady: For the time you're doing this book, address your student(s) as Master _____ or Lady _____. Make them feel they are in the Middle Ages! -Remove the ink from the burner and let it cool. -Strain it into the jar and add vinegar and salt (this preserves the ink). Leaves of Gold: Celia encourages parents to explore this site thoroughly. Lots of goodies! You might want to pick and chose parts of it to show your student. I especially loved the slideshow because there was a link ("Discover on Your Own") to questions that made you look closer! There are also instructions on how manuscripts were made and ideas on how to make your own. Also, you might want to print out this PDF handout to help you better understand illuminated manuscripts. Visit this interactive demo of how a Medievel manuscript is made. Excellent! Bibles and Bestiaries: A Guide to Illuminated Manuscripts by Elizabeth B. Wilson. This book is more for the parent, to glean info to share with the student. Describes how the manuscripts were made and shows many examples of various manuscripts. Illuminations by Jonathan Hunt. This is an alphabet book, each illuminated letter is for a word associated with the Middle Ages.....from Alchemist to Zither. Lots to be learned in this book (oriflamme, portcullis, quintain, wattle and daub, etc). You might wish to have your older student research the history of writing and printing and how books came to be. Two possible books to get him started: The Story of Writing and Printing by Anita Ganeri and How Our Bible Came to Us: The Story of the Book that Changed the World by Meryl Doney. Learn about Johann Guttenberg, who made copying books easier and faster with the printing press. Extend this unit by exploring more of the Middle Ages! See HSS's unit based on Castle Diary by Richard Platt. And don't forget Five in a Row's unit on Duchess Bakes a Cake! Here's a Bible lesson to go along with the idea of illumination.